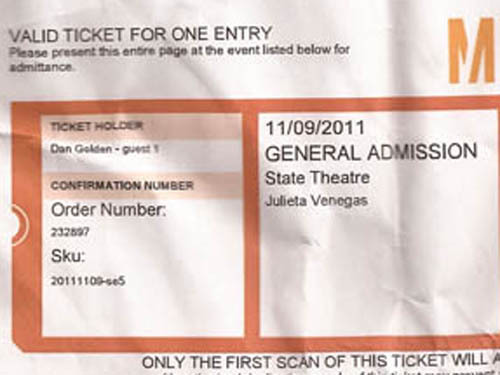 11/9/2011 - Julieta Venegas at the State Theater tonight!! While it was neat to see a pop rock Mexican singer right here in Virginia, I also didn't know too much else about her but I knew a friend wanted to go too, so I went with my friend Zeena. We had a good time despite me losing my license (which happened to fall out in my car somewhere) and me being all paranoid because I was going on a long road trip up north the next day. I did recover my license but it felt weird to have an underage stamp on my hand again since I didn't have it with me in line at the door. Still the show was okay, but it was packed and definitely interesting to see a packed show like that of another culture entirely.